Budgeting for Local Governments and Communities is designed as the primary textbook for a quarter or semester-long course in public budgeting and finance in an MPA programme. Many currently available texts for this course suffer from a combination of defects that include a focus on federal and state budgeting, a lack of a theoretical governance framework, an omission of important topics, and typically a lack of exercises and datasets for student use. Budgeting for Local Governments and Communities solves all of these problems. The book is exceptionally comprehensive and well written, and represents the efforts of veteran authors with both teaching and real-world experience. Special Focus on Local Government Budgeting: focuses exclusively on budgeting at the local levels of American government, which are responsible for spending 40 percent of the taxes collected from citizens. Polity Approach to Local Budgeting: presents an introduction to local budgeting as the central political activity that integrates the resources of the community into a unified whole. Budgeting is presented as governance work, rather than as a unique set of skills possessed by analysts and financial specialists. 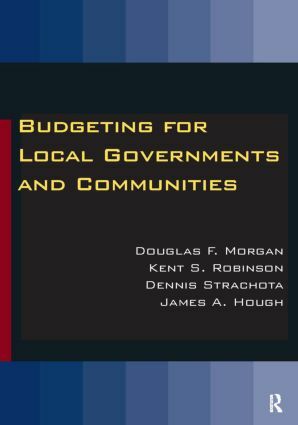 Legal, Historical, Economic and Moral Foundations of Local Government Budgeting: provides readers with an understanding of how the structures and processes of local budgeting systems are firmly tethered to the underlying core values, legal principles and historical development of the larger American federal, state and local political systems. Electronic Datasets and Budgeting Exercises: the text includes access to extensive electronic datasets and practice exercises that provide abundant opportunities for students to "learn through doing." Extensive Glossary and Bibliography: covers terms on the history and practice of local public budgeting.